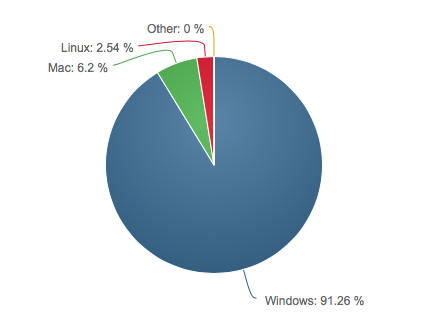 Linux is more popular on the desktop than macOS now - https://netmarketshare.com/ -> Desktop Trend (6.91%). NetMarketShare is a company which is sponsored by Microsoft, so I believe that their data is reliable enough. Taking statistics into account, what would be your response about Linux version of Affinity Photo and Designer? This is something that has been requested before but we have no plans to develop Affinity apps for Linux i'm afraid. Can I ask why? You won't make version for Linux even despite the fact that linux popularity is higher than mac now? Beyond that, it is likely a high percentage of Windows & Mac users are running graphics software similar to AD or AP, while it is uncertain if that is also true for Linux users. The market share doubled in two months, which seems odd. Perhaps it's all those system admins downloading Ubuntu/openSUSE/SLES from the Windows Store and playing with Linux subsystem on Windows. However, it's worth bearing in mind not just market share in absolute numbers, but also the popularity of Mac's amongst creatives and in the creative industry, which market share alone doesn't reflect. It is not just numbers that count, it's the type of user. It seems that most people use Linux as a way of turning an old PC into a browser. The typical user seems to do everything possible to use free software, like a badge of honour. The other users use it for servers, specialized requirements and so forth. Linux is an enthusiasts machine. That's no good for a commercial graphics product. Compared to a Mac, which has traditionally been a Graphics machine with people willing to pay. Even Windows users will pay. The big issue is lack of support. If something goes wrong, you are on your own. The shiny Mac or PC has umpteen shops willing to supply and fix, for a price. Commercial companies need professional support! How many shops do you see offering Linux machines with back-up? 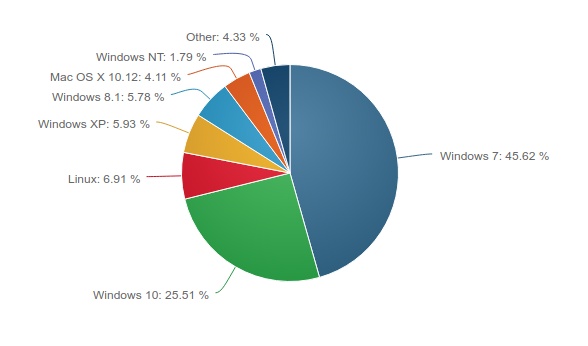 It seems that most people use Linux as a way of turning an old PC into a browser. It isn't just old PC's. I am one of many people interested in using the Raspberry Pi & similar inexpensive, low power computers for a variety of projects. Although there are other OS's available for the Pi, by far the most popular is "Raspbian," a specialized version of the Linux Debian distro. Since many projects involve constant or periodic internet connections, & the OS probably will be identified as a desktop version of Linux, it seems likely these little computers are among those included in survey numbers, as well as other computers that lack the horsepower to run graphic apps like AP or AD at useable speeds. My guess is that Serif/Affinity also values its steam-lined and stylish interface. How can they guarantee that with all the Linux desktops available? And with Apple shifting/shifted away from OSX and its UX underpinning, Affinity would then have to support Windows, MacOS, and any number of linux desktops. Not much of an opportunity for expansion there, IMO. Check data range. Sometimes netmarketshare set by default previous months or even years. I don't see the convergence between the stores that offer laptops with Linux, and companies that offer the software for Linux. Everyone can install Linux on their laptops if they want to and professionals in the most cases want to. Wrong - there is only one system and is called GNU/Linux. GNU/Linux supports a large number of graphical libraries, in the most cases companies that decided to provide their software for GNU/Linux use GTK+. GTK+ is cross-platform library that support light and dark modes. It will work well on Ubuntu, Mint, KDE Neon, Pop!_OS and any other GNU/Linux distribution. If you talking about distributing the software you can use cross-distributions utils like AppImage or Flat packages. Affinity sell their software for Windows through the web service. I can't see any problems to do the same in case of GNU/Linux version. But, if Affinity would like to sell Photo and Designer Linux versions through AppStore there is no problem too. We have three AppStores - GNOME Software, Elementary AppStore and KDE AppStore. Any of these can be installed on any GNU/Linux distribution but in my opinion it would be better to do this through the web and AppImage or Flatpak. AppImage is very similar to DMG. It contains all dependencies and it works on any GNU/Linux distribution. 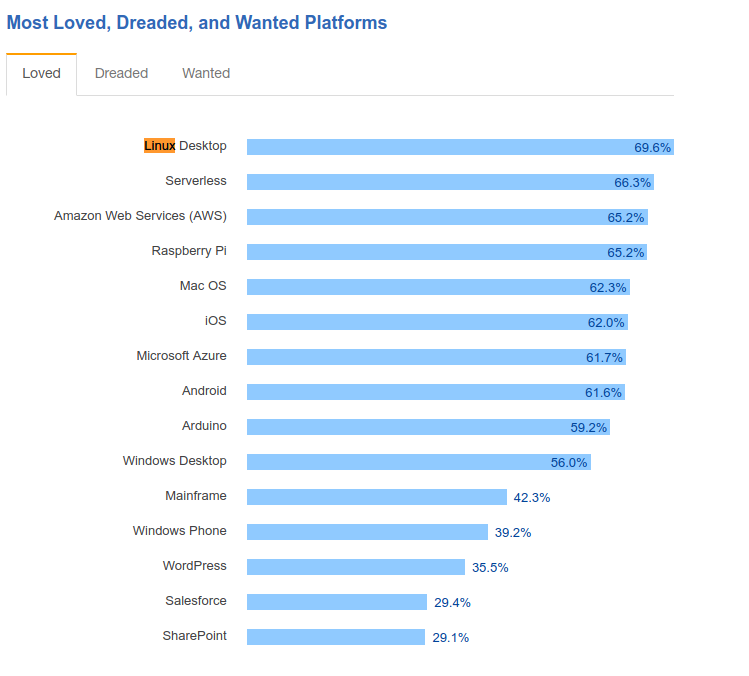 If developers have money and there are ~33% developers that use Linux Desktop and many of them use Linux Desktop for Web Development and Mobile Apps that mean you get pay off your effort to provide your software to GNU/Linux. My English level is far from good but I believe you will understand my point. Calculations are very simple - professionals have money and many of them use GNU/Linux that is why we should provide GNU/Linux versions of our software. I work as Web Developer (Angular4, VueJS, Django, Laravel, NodeJS) in company that provides to the market the best NLU and ASR Artificial Intelligence. Everyone in our company use GNU/Linux for developing. I have tested few times Affinity for Windows (Gnome Boxes) and I would love to buy it but GNU/Linux version only. I can't even think about switching to Windows 10 because my whole development stack heavly depends on Docker and Docker for Windows have a lot of limitations. For example, Docker for Windows doesn't support inotify that is core feature of Docker that I use a lot in my work. Statistics for Humble Indie Bundle: http://cheesetalks.net/humble/ - again Linux users pay average more than Windows na macOS users. JetBrains provide their software for GNU/Linux and they admited on the blog post that a lot of their customers are GNU/Linux users. Calculations are very simple - professionals have money and many of them use GNU/Linux that is why we should provide GNU/Linux versions of our software. The calculations are about as far from simple as one can get! For example, there has been much speculation on the web about the very unusual spike in Linux adoption in the last two months, as reported by Net Market Share. This article discusses why that might be so, but it is still guesswork, & the accuracy of Net Market Share figures depends on what may be a flawed extrapolation of its samples to a wider trend. There is no way to know if sniffing browser strings & using tracking codes on sites Net Market Share (or other similar services) sample really can be used to draw any firm conclusions about the type of user most likely to be using each OS, or even if all the computers they are using are powerful enough to run pro class graphics apps at useful speeds. Beyond that, what people say they want & what they actually would buy often are for a variety of reasons very different things, particularly for something as varied as what "platforms" or "professionals" mean to different people. Serif must also consider the languages the Affinity apps support & how that affects worldwide mainstream market appeal, as well as development & maintenance costs, maintaining reasonable feature parity across all supported platforms, & so on. "Everyone can install Linux on their laptops if they want to and professionals in the most cases want to." "I work as Web Developer (Angular4, VueJS, Django, Laravel, NodeJS)t"
I think you have answered your own question. Linux is for nerds (no offence). Most people. i.e. paying customers, lack your expertise. They expect to buy a working PC, like buying a TV or Phone. As I said, I experimented with Linux but there was so much missing. No printer drivers ( Mitsubishi dye sub printer) no green screen software, no internet design software, no DAM, no colour management software. The list was very long . . . . . Things may have improved on the software support ? I am talking about Stackoverflow stats now. JetBrains and their professional software have been successful in the GNU / Linux market, and I don't see why Affinity Photo and Designer would be the case. Both are targeted creative people. Every creative person is nerdy somehow. I don't want you to use GNU/Linux. I just want to buy Affinity Designer and use it on GNU/Linux in my work, thats all I've asked for. 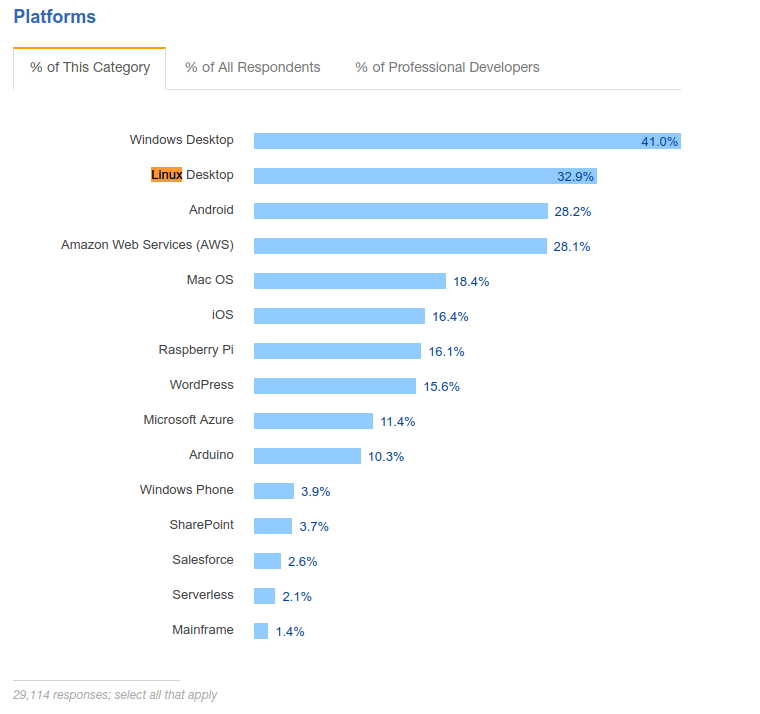 I try to convince Affinity devs team providing bunch of statistics - mainly from stackoverflow - that professionals are using GNU/Linux, including professionals that create web or mobile content. I don't see the point in convincing regular people to use GNU/Linux and I can't see the point if someone saying that their software can't be provided to GNU/Linux because a lot of regular people don't use GNU/Linux. Affinity Photo and Designer, as well as Jetbrains software and others professional applications are not targeted regular users but professionals. In other words - I don't care if you know how to install GNU/Linux printer drivers or not. PS What do you mean by "internet design software"? And "green screen software"? Everyone can install Linux on their laptops if they want to and professionals in the most cases want to. 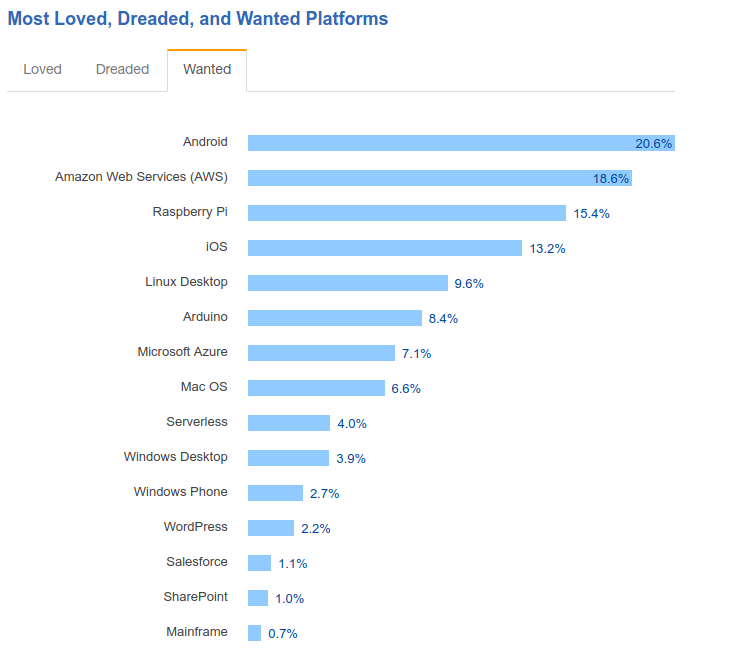 I would love to see some hard data about exactly what kind of "professionals" want to install Linux on their computers (laptops or desktops) & how that might correlate to their desire or willingness to buy Linux versions of apps like the Affinity ones. 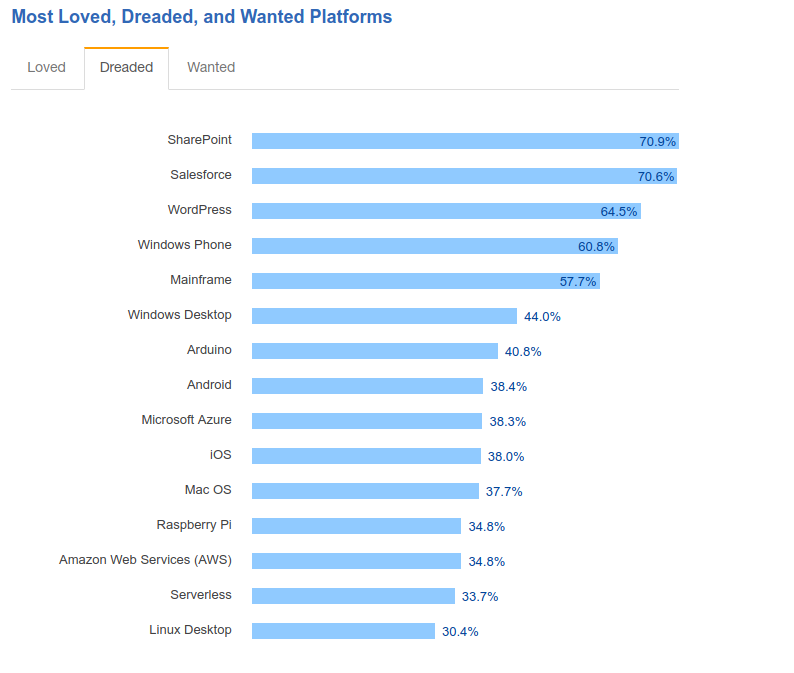 The Stack Overflow charts are based on the responses they get from people who identify themselves as "developers," but it is evident from this chart that very few of them say they specifically are graphics designers. Of course, the largest category by far is "Web Developer," so one could argue that involves graphics design, but how strongly that correlates to a real, profitable market demand for Serif is still a grey area, if for no other reason than there is no way to know how many of the 64K or so people who responded to Stack Overflow's survey are representative of the larger market Serif would have to attract to make any money from Linux versions. It should be fairly obvious that almost everyone has a computer that can run the Mac OS or Windows, so it is not as if they can't use the existing apps. An unanswered question is how many of those who want an all Linux workflow would actually buy a Linux version, particularly if they or their employers already license Windows or Mac graphics apps like those from Adobe. Like what they use in movies. Photograph someone against a green background, and the software removes the green and substitutes a different background. Like a dinosaur. "In other words - I don't care if you know how to install GNU/Linux printer drivers or not." I know how to, but the drivers are not available for linux, like about 90% or serious software. It is just not available.. In fact even the standard Canon printer drivers did not work. Linux was such a waste of time, sadly. I bought a new PC instead and use Linux for browsing, sometimes. That is pretty much all it seems (or seemed) useful for. Unless you are a nerd or a developer. Out of interest, why not just buy a PC, I bought a secondhand Dell running System 7 as a spare. Runs Affinity fine ! Not as quick as my i7, granted but it's OK! Cost me about 45 euros. Before Serif had released Windows version you could said exactly the same. No one can answer your questions for now, we are not wizards to answer this kind of questions. There is always some risk. As a rational people we have to use only this data we have for today. I have provided some of them. Adobe Dreamweaver? It is a shame to use it for frontend nowadays. Devs at the meet.js conference would laugh at you if you brought Adobe Dreamweaver with you. Any statistics for that "like about 90%"? Or for "serious software"? You see, I have problem with people like you that spread FUD. So, Intellij IDEA, PyCharm, Apache, Nginx, Visual Studio Code, Microsoft SQL Server, .NET Core, WebStorm, Lightworks are not serious software, right? Again - I don't really care what you think or what stereotypes you spread here about GNU/Linux. You don't care about my opinion about macOS and Windows too, right? Lets get back to the point of the discussion - statistics from various sources. I provide you bunch of different statistics from different markets that say one important thing. GNU/Linux market is growing, GNU/Linux are very popular among professionals according to Stackoverflow and GNU/Linux users pay in average more than macOS and Windows users according to Humble Indie Bundle. Again, I am not here to arguing GNU/Linux is good or bad. I just would like to know what is Serif response in the context of data I have provided. Don't get me wrong, I like Linux. But you have to be realistic. None of the software companies you mention are serious consumer suppliers, not even small ones. Like Microsoft (office type stuff), Adobe, Quark, Corel, Apple, Cyberlink, Movavi, Magix or Serif. Surely that tells you something ? Corel tried a few years back but it was a disaster. Before Serif had released Windows version you could said exactly the same. On the contrary, there is a huge, very well established & quite profitable market for Windows graphics software, plus quite a bit of market resistance for the subscription model Adobe has adopted. This did not completely eliminate the risk for Serif but by any reasonable standard it certainly minimized it to an acceptable level. As a rational people we have to use only this data what we have for today. I have provided some of them. As rational people we have to decide if the only available data is sufficient to draw any meaningful conclusions from. When it is not, it would be quite irrational to try to do that. It's not happening anytime soon, if ever. Just use PhotoLine in WINE (the devs support this even with an alternative Linux-compatible colour management option), Krita, Gravit Designer, InkScape, Gimp, Fusion, ... Lots of options already. Affinity would have to compete in an already quite small market. Another question is (to which Toltec alluded to) what Affinity would be used for by "professionals" on Linux: which, as far as I am aware, predominantly consists of developers (I am one myself). I don't see more visually-inclined graphic designers and photographers using the platform (in my experience). Linux is great as a development platform, not so great for graphic designers, or motion graphic designers. It is used quite a bit in VFX/3D production houses, though, but we are talking about a relatively small group of users in this case. The average developer/UX designer has very different needs compared to a graphic designer and photographer. Great tools already exist on Linux to help front-end devs in this regard, which isn't going to help sell Affinity products. Statistics are a small part of the total equation: other factors must be taken into account as well. In 20 years of teaching in graphics, design, and web development, only a handful of students had Linux installed on their laptops. Linux still isn't part of the "design culture". Microsoft supply Visual Studio Code, .NET Core and SQL Server for GNU/Linux for example. In my opinion data I have provided is sufficient enough. Of course. You are entitled to your opinion. Your opinion, nor mine, nor any other user's does not matter. Please refer to this earlier post to see why. This is not a new topic. It is one that keeps reappearing. Each time the data, such as it is, has not been enough to convince Serif to make any plans for developing Linux versions of its products. That does not mean that there never will be enough data to convince them to do this, but it does mean that they do not agree with you that they have to use only the data available today (whatever that may mean) for altering their plans. Green screen software: Nuke, Fusion, Blender, Natron... Industry-standard solutions are available. NLEs: Davinci Resolve, Lightworks, etc. Internet "design" software: Atom, Netbeans, PhpStorm, Eclipse, Sublime, Brackets, ... the list goes on and on. If you need something similar (but MUCH better) to Dreamweaver, Pinegrow + Atom is a quite excellent combination. Much better than DW ever was. Dreamweaver is a 'has-been', and pretty terrible nowadays - a shame, though. Adobe ruined it. Muse... Let's not mention Muse or similar tools: abysmal. DAMs are available, if you look around. Perhaps not at the same level as some available for Mac/Windows, but still. Colour Management: I use DisplayCal on both Windows and Linux. Works well. The only things that are really missing are indeed some drivers, and a good DTP app. I miss InDesign/QuarkXpress level software on Linux. If you are on Linux it is best to shop for printers that are actively supported, and not the other way around. For scanning I use VueScan on both platforms - no need for scan drivers. My old scanner was no longer supported on Windows either, and Vuescan is heavenly in use. But yes, although Linux is quite capable as a designer platform now, the lack of a native high-level image editor is quite conspicuous. Krita is excellent for artistic work (better suited than Photoshop! ), and PhotoLine works like a charm in Wine, which make a great combo. But it would be nice to have a native port of either Affinity or PhotoLine. Gimp is okay, but just can't compete at that level. I just don't see it happening, though. Nor for years and years to come. I have nothing to add, I said everything I wanted, so if Serif still doesn't change their mind then I think the topic can be closed. The technical term is Chromakey - it doesn't have to be a green screen. Mind you, I had to photograph a model once wearing a blue and green dress. Spooky !